He can strut, jump around, play soccer, and gloat when he wins. He can serve you drinks and dance, even (kind of) moonwalk. He's like lots of other 28-year-olds...except he's a robot. Honda's Asimo, the product of nearly 30 years of robotics development, recently showed off a few new skills for autoexpress.co.uk. Alongside their reporter, Asimo played soccer, boogied down, and served a drink using the 30 degrees of control in his dexterous, multi-jointed plastic fingers. 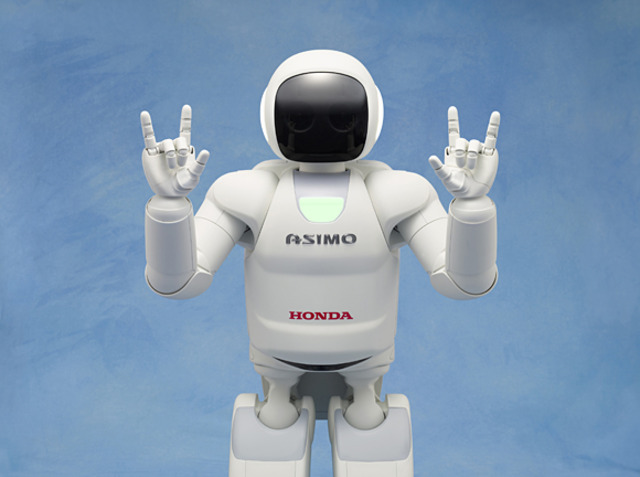 Asimo, which began as a pair of robotic legs that Honda eventually trained to master the human gait, is an acronym for "Advanced Step Innovative Mobility." Overall Asimo's body contains 57 independent degrees of control. Asimo's onboard sensors, cameras, and stabilizing elements are designed specifically to interact with human users. Now they just need to install a file full of jokes and life advice, and Asimo could begin replacing bartenders worldwide, or at least become the hot new choice in domestic servitude. That's right humanity, you've finally found a partner who will listen to all of your problems, dance with you AND happily fix you drinks!